Remains of a building at general headquarters, Loveday internment camp. Winter in the Riverland district of South Australia is a season of extremes: dry, often gloriously sunny days and nights so bitingly cold it makes it difficult to sleep. I found out first-hand when I visited Barmera in June for the 70th anniversary of the opening of the Loveday internment camps and my hotel ran out of portable heaters—so I can only imagine what it must have been like for the internees who endured sub-zero temperatures while sleeping in tents in the early days of the camp before huts were built. June 11, 2011 marked the 70th anniversary of the opening of the Loveday internment camps. 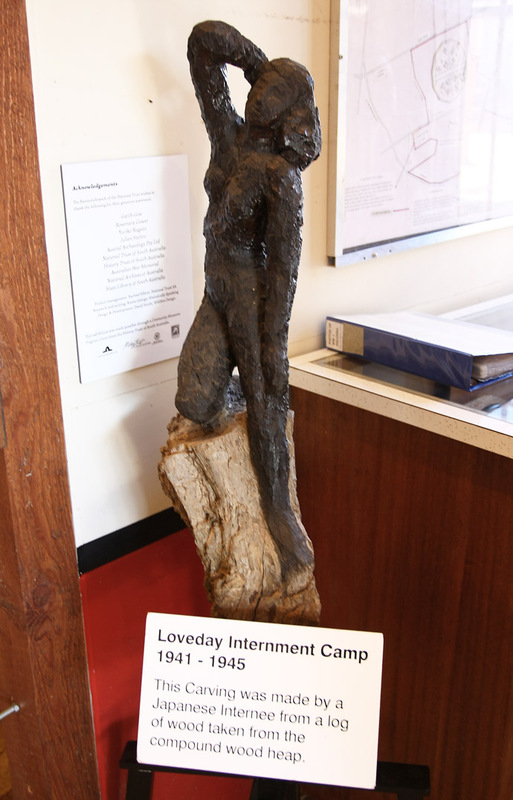 The camps’ first inhabitants were 458 Italian internees who had been transported from Hay, NSW to Loveday Camp 1 near Barmera, South Australia. At their peak, the Loveday camps held more than 5000 Italian, German and Japanese civilian internees and POWs. The Barmera branch of the National Trusts of Australia organised a weekend of activities to mark the anniversary. I attended (fresh off a plane from New York! ), arriving in Barmera on the 11th to find it filled with visitors, as the weekend also coincided with Barmera’s annual country music festival. 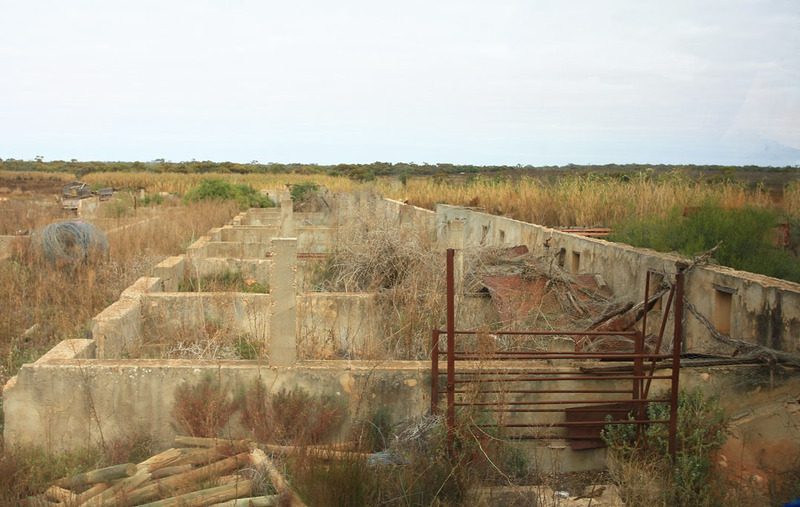 Remains of the piggery structure at Loveday internment camp. Max Scholz delivered milk to the Loveday camps when he was a boy and wrote a book about his experiences: As I Remember: The Loveday Internment Camps (self-published, 2004). As part of the 70th anniversary weekend, he led a bus tour of the former sites of the Loveday camps. A couple of months earlier I visited Barmera on a reconnaissance mission and Kris and I attempted to find the sites ourselves, but we ended up driving around in circles. There is very little in the way of signage, and most of the sites are now on private land. Furthermore, because many of the buildings were dismantled or made of wood, they have deteriorated over time and there is unfortunately very little to see—only the concrete foundations of a few buildings remain. 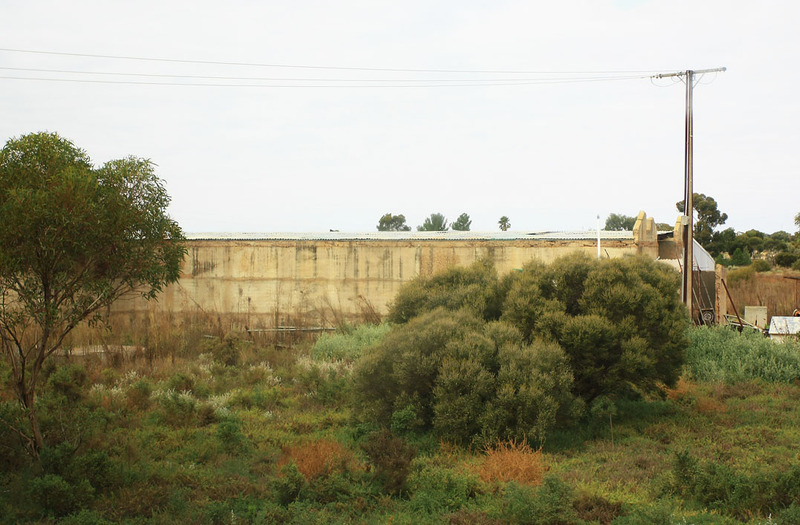 But Max pointed out areas of interest, such as the location of the now defunct train station that was used to transport internees from Adelaide, the remains of a concrete building that stood in the general headquarters, and the remains of a piggery run by internees. Guests at the dinner watching military archival footage of Loveday camps. The opening of an internment camp may seem like an odd cause for celebration, but the 70th anniversary attracted quite a lot of interest both in the local community and further afield, so it was a good opportunity for people to find out more about the history of the Loveday internment camps. 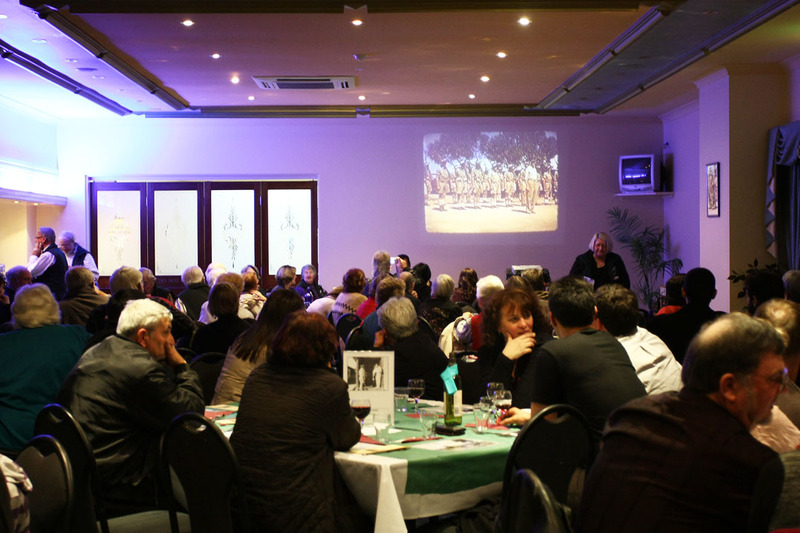 About 100 people attended the anniversary dinner at Cobdogla Club, and guests included local historians, museum professionals and members of the Italian community who turned out in force to learn more about their ancestors’ lives. Speakers included Tony Piccolo, state Labor MP for Light, South Australia, whose Italian ancestors were interned at Loveday; Mia Spizzica, PhD candidate at the University of Melbourne, who presented her findings on the daily life of Italian internees at Loveday; and I gave a short presentation about my research into the lives of Japanese internees at Loveday. Rare colour footage of Loveday camps was also shown. 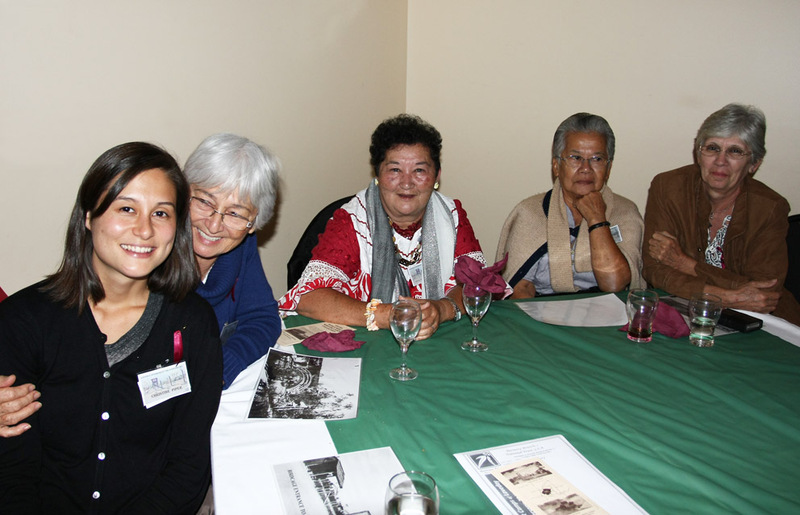 Me with some of the New Caledonian women whose Japanese relatives were interned at Loveday. 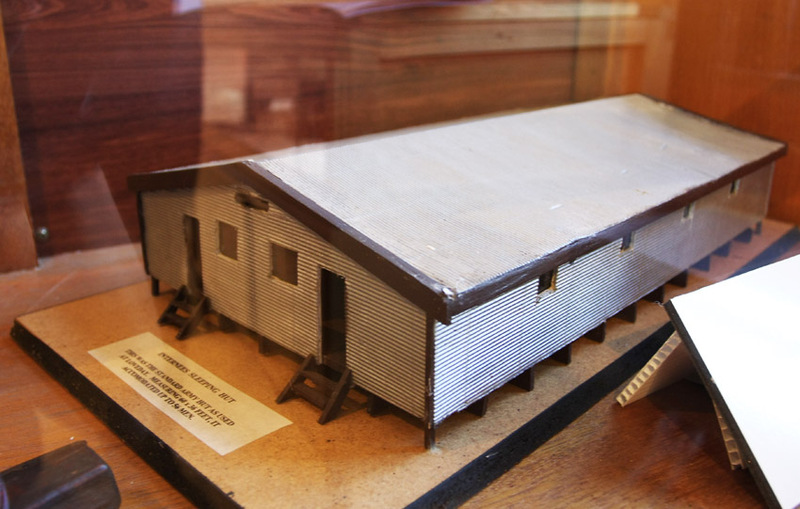 A model of the sleeping huts used at Loveday, designed to hold up to 56 men (Cobdogla Irrigation and Steam Museum internment display). The weekend culminated in a visit to the Cobdogla Irrigation and Steam Museum’s Loveday internment camp exhibition, with special drill squad rifle salute demonstrations throughout the day. Although I wasn’t able visit the museum on this occasion, on a previous trip I had found the exhibition packed with information relevant to my research—particularly the models of the camps and sleeping huts, and the tools and handicrafts fashioned by the internees. « Do you have a story about Japanese civilian internees? I grew up on land given to the returned service men following the war which had been part of the Loveday POW camp. The land my father owned had been for opium production & I remember these lovely purple poppies still growing each year well into 1970’s. Apparently they just ploughed them into the ground, no destroying like today. The fruit block owned by our neighbour had a guard hut complex on it which was very well preserved with even sliding heavy duty doors & barred windows. They used it as pickers quarters so it was well preserved. I think it is still intact up to this day.It was owned by the Swinstead family. The next fruit block along from them also had 4 large concrete tanks built into the ground which were full of water. We use to play around them as children but I have no idea as to their original purpose. I had forgotten all these things until I came across your article.